On Wednesday I got round to the exciting activity of testing out the lino cuts Alice and I made last week for the William Morris Society. 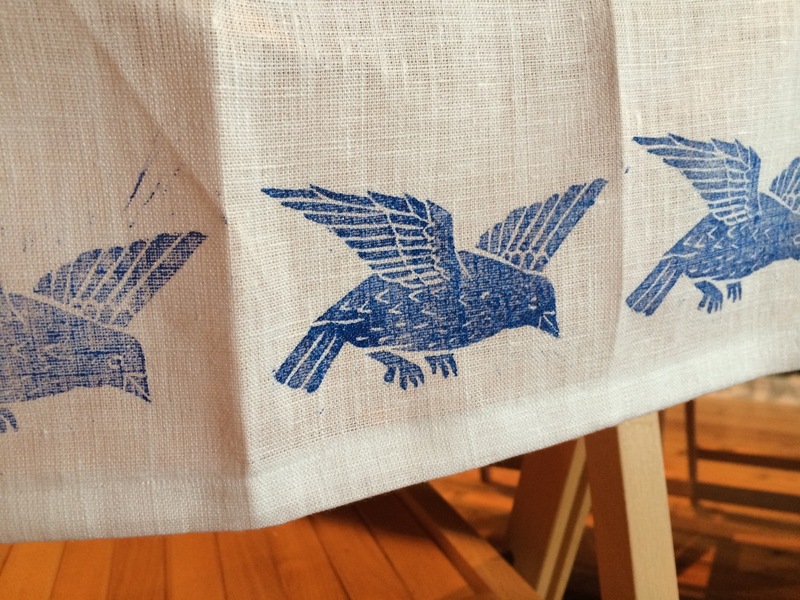 I keenly/ naively decided to test them out on my nice Belarusian linen, with which I’ve been learning quite a few things about fabric printing lately, and the extra challenges it throws in. I used pots of Dylon fabric here, because I happened to have some different colours at home. Permaset printing ink gives a clearer, easier print, I think because the consistency is thicker, but since I only have black – not very common in Morris’s designs – I opted for the Dylon today. It took me a long time to realise that a hard roller is the wrong tool for the job when it comes to printing on fabric. A foam roller is best – art shops supply dinky versions of the DIY ones. Put a blob of ink on a flat tray, then lightly spread it out using the roller, lifting the roller up a few times to make sure it has a layer of ink all over. Then, and this is crucial, roll it very lightly over the surface of the print, trying to cover the surface evenly and avoiding the background. If you press the roller into the print, as you would with a hard roller, then the ink will just get pushed into the lines and negative space of the design, accumulating and causing a ‘bleeding’ effect. And swearing. Press the lino quite hard onto the fabric for about 30 seconds or so. As you can see from the test strip, a lot of ink was picked up by incidental cutting lines in the background. I really liked the ‘radiating’ effect this gave, but, for our purposes, they had to go. So, I used the initial test print as a guide to tidying up the lino cuts. Admittedly, Morris probably would have thought these initial attempts pretty shoddy – the prints are inconsistent and have a few background marks. But then, I quite like the telltale signs that tell you something’s handmade. By the way, I’ve written this post from Kiev, where I’m on a three-day holiday before I’m off to Donetsk. Pictures to follow! I LOVE these! They really call my name. Thank you so much for the inspiration.